Laura and Jen talk about how they met at Stitches West and decided to start a podcast. Laura is knitting a Clapotis in some Dizzy Blonde Studios Superwash Sock dyed to match the color of her cat, Sassy. Jen is working on the Easy Baby Sweater out of Classic Elite Liberty Wool. She’s procrastinating on the sleeves. That’s okay because Laura procrastinates on sock feet. 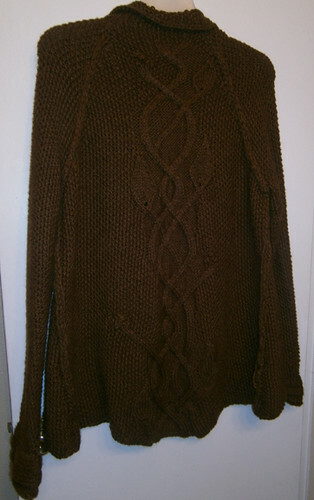 Jen mentions her Wispy Cardi, where she also had sleeve hang-ups. Jen is also working on the Madroña by Romi Hill in Prism Delicato. She recommends winding that yarn in an outside-pull ball rather than a center-pull. We mention yarn bowls by Knit Witch and Jennie the Potter. 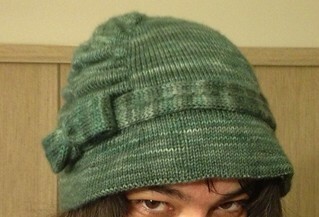 Jen finished the Elizabeth Zimmerman Cloche in Sweet Georgia BFL Sock. This was a sample knit, but she wishes she could keep it! 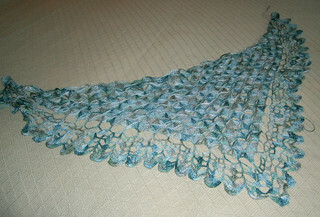 Laura finished a crocheted shawl– The Summer Storm in Dizzy Blonde Superwash Sock. She’s going to make another one for her mother-in-law. Ninja Kitty is gonna get you! 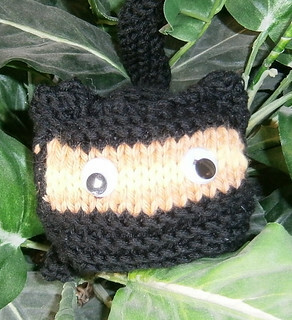 Laura also needs to make some Kninja Kitties! Jen is not working on her Bashful Butterflies Shawl because she’s not motivated. Laura suggests using a 20-sided die to help Jen power through it. Laura is not knitting on her 22 Leaves Shawlette because she can’t decide on bead placement. Jen isn’t knitting on Sock Strap socks because she broke a needle. This is the second time this has happened to her since Christmas. Laura had to frog her Sylvi Coat due to poor yarn choice. Acrylic yarns don’t block. Laura is going to recycle the Berroco Vintage Chunky Yarn from her Sylvi to make a Yggdrasil Afghan. Jen has QABLE! (Queue Acquisition Beyond Life Expectancy) She can’t decide. She will use some Delicious Yarns to design a sweater for her nephew. Jen talks about learning to knit, her interests outside of knitting, her blog, her geeky fandoms, and her statistically significant other. Laura gives her “origin story.” She talks about learning to knit, starting to design, her geeky fandoms, her husband, her stepchildren and step-grandchildren (She’s a young step-grandma! ), her dogs, and her yarn dying (Dizzy Blonde Studios and the Mean Girls Yarn Club). We mention the Charlotte’s Web Shawl, the Wingspan Shawl, and bandwagon knitting. We also talk about old-school geek shows. The Knotty Girls are hosting a World Wide Knit in Public Day Event at the Grand Californian Hotel and Spa on June 15, 2013 from 1 to 3pm. No entrance to the park is required, and parking at Downtown Disney is free for up to three hours (five with validation from a restaurant or the movie theatre in Downtown Disney). KnitDizzney will be Sunday, September 8th, 2013. More details to come, but we’d love to spend a day at the Disneyland park with you! World Wide Knit In Public with The KnottyGirls! Please check out the Event Page for details and to sign up. (Sign ups are not mandatory, but highly encouraged!) We look forward to seeing you there! Only a few more days until launch! Here’s another promo to tide you over! The promo is up! Go have a listen!